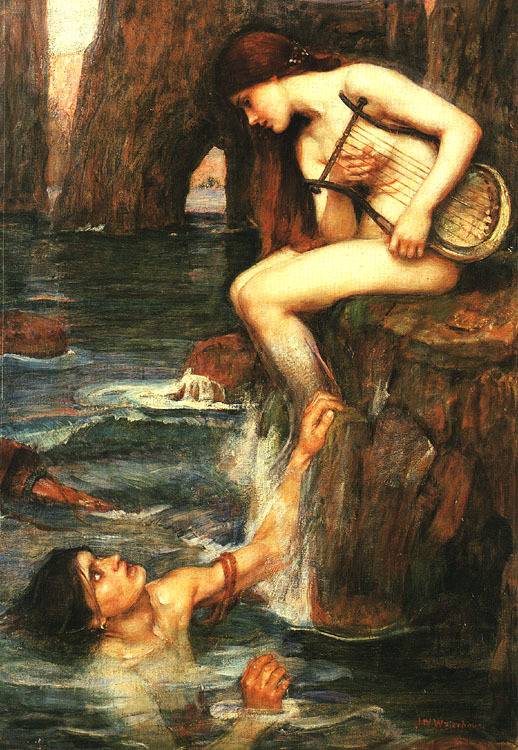 Sirens are identified as sea nymphs who by their sweet song they lured mariners to their deaths. They are imaged as raptor birds with female heads. The derivation of the name seems more associated with their bird-like nature. The name means ‘she who grasps, binds, enthralls’ and derives from Indo-European ‘twer-2’, ‘To grasp, hold hard’,’ya-‘, ‘To be aroused’ and ‘en-‘, ‘In’. This concept seems likely to come from the Indo-European culture who were not associated with the sea. So the concept must have been modified when it got to Greece. Sirens as partly virgins and partly birds. Aelian tells us (Ael., Nat. Anim. drowned from sheer vexation at the escape of Ulysses. with their sweet voices represent the distractions that keep you from your goal. ceased to exist as a result. other countries, such as Egypt, are more commonly of this form. would help me give a presentation on the Sirens? Thank you! Question: Are there any songs about the Sirens? Question: i’m doing a speech on the Sirens for my english class and what i really don’t understand is , whether or not the sirens father is acheloos the river god , or phorcys the sea god. also i’ve read that there are actually five sirens instead of three but i can’t find much info on that. As if this were not enough there are also variations on these names. Question: How were the Sirens born? Answer: They were daughters of a god and goddess. Question: why do the sirens lure sailors to their deaths? come, who bewitch all men, whosoever shall come to them. so sure. The fact that eating has a sexual connotation may be very relevant. both had to deal with the Sirens. I understand most things about the sirens; my question is why did they kill the sailors? I get how and everything, but why did they do it?